#Microsoft365 #Office365 has forever changed the way we deal with technology. Gone are the days of installing a new version of something and then complaining about it for 3 years until you invest in the next version. It’s time for all of us to embrace a new way of “agile” progression, here’s some tips and resources to change the way you think and better prepare yourself. Office 365 has two options for releases, Standard and Targeted Release. Standard release will give users the updates as they are released broadly to all Office 365 customers. With Targeted release you can define which users receives ‘early’ updates, for example IT or Power Users. I’m not a fan of keeping updates back because you’re scared something will break or someone will cry. You’ll probably not end up releasing the updates for…. ever. Face the music and work through it. Make sure you have a team of people focusing on specific products who can support whatever gets released etc. It’s also important that your users understand what Office 365 is, and what it means to get updates regularly. What should they do if Outlook doesn’t open after an update got released? Surely we chose Office 365 because we want to be part of the future and not wait 3 years for it? Pros and Cons I tell you. Make sure that your company really understands what Office 365 is and how releases work. Communicate regularly, through awareness we minimize impact. Share the resources with your users (road-maps / training center / what’s new in Office 365) – so they can learn to help themselves as well. 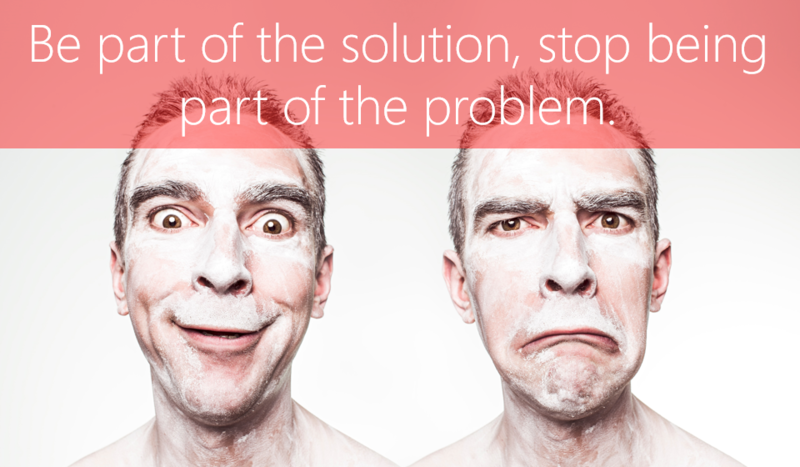 If something happens – BE PART OF THE SOLUTION, NOT THE PROBLEM – please don’t complain and not do something about it. Log a Service Request on the Office 365 portal. Is it something you think that should be changed or added? Go to User Voice and see if it’s been logged? If not, log it, if yes, vote for it. Your Product specialist / Power Users should be proactive. If a new feature is released, they should go try it out immediately, not just to mitigate risk, but also to get geeky about it and share the good news as quickly as possible with the users in the company. Welcome to Office 365 feedback and suggestions site! We love hearing from our customers. If you have suggestions for how we can improve, please share them with us here or at one of the related sites listed on the right. While we can’t respond to every suggestion, we are committed to reading every post. As an Office 365 subscriber, you regularly get new and improved Office features. Take a look to see what’s available to you today. The mission of this online community is to provide a platform for IT Pros, Developers, Office 365 and Azure Users, cloud fans and Microsoft to interact. It is a central destination for education and thought leadership on best practices, product news, live events, and road-map. I absolutely love (Microsoft) Office 365. Yes, it’s a bit like being married and there are days when we go to bed mad at each other, barely speaking. But Microsoft is my partner and together we’ll make each other better than we were the day before. Thank you Microsoft, for giving me the most amazing set of tools with which I can help transform people into the incredible beings they were always supposed to be.